Growing your social following and increasing engagement has been a challenge for most businesses. There are plenty of promotional tools, but they’re often confusing and hard for inexperienced users to utilize. Twitter is testing automated account promotion to ease the challenges and time commitment for brands and businesses. Here’s how. Twitter recently sent out an invite to their private beta of a new program which automatically promotes your account. For $99/month, they will run a Promoted Account campaign for the entire month. They’ll also run a Promoted Tweet campaign that includes up to the first ten (10) tweets you send each day. While this promotional option is still in beta testing, it’s appears to be an easy way for less experienced advertisers to increase the reach of their messages and help grow their following at the same time. Targeting for the automated account promotion is set by either interest or metro level, so while it doesn’t offer the same highly-targeted granularity typically found in Twitter promotions, it should still help your account appeal to a relevant audience. To understand how automated account promotion is performing, advertisers will receive bi-weekly reports showing follower and engagement growth. These reports will highlight the additional reach, followers, and engagement achieved with the automated account promotion, above and beyond their organic levels. Though this simple way of account promotion looks great for small brands without social media promotion experience, it’s unlikely that $99 will get you very far. Considering the average Twitter click costs anywhere from 25¢ to $4, that’s not a whole lot to go around when you divide the $99 across up to 10 tweets a day and an average of 30 days in a month. 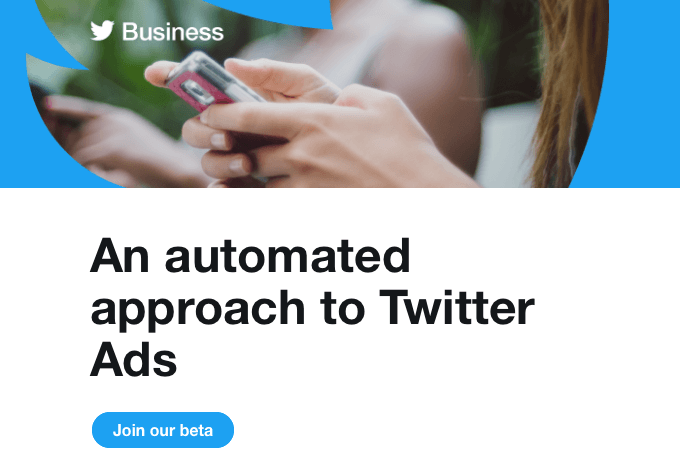 This new automated account promotion offering from Twitter appears to be a super simple way for many brands to increase the visibility of their posts and grow their following. Though it’s unlikely to attract those already advertising on the platform, it’s a simple way for many to get started. Interested in checking out Twitter automated account promotion for yourself? You can sign up for a beta invite here.